16-year old female terrorist attacked Jews at entrance to Old City of Jerusalem. 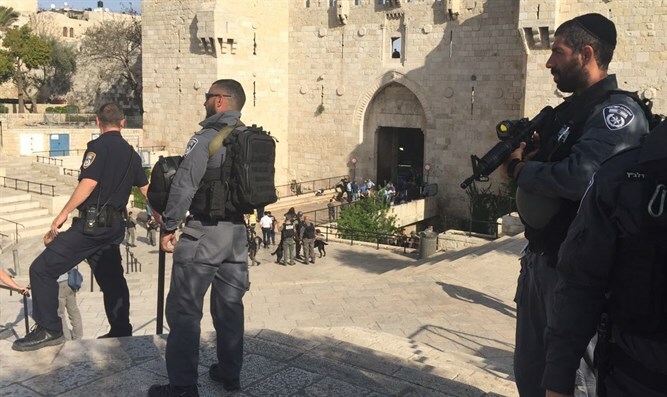 A knife-wielding female Arab terrorist knife attacked Israeli police and Border Police officers deployed at the Damascus Gate at the entrance to the Old City of Jerusalem Sunday evening. Officers responded quickly to the attempted stabbing attack, neutralizing the terrorist before she was able to reach her intended target. A police spokesperson reported that security forces at the scene managed to shoot and kill the terrorist, with no additional injuries reported. “A terrorist came to the stairs [facing] Damascus Gate and approached a police unit deployed there. Apparently she drew a knife and pointed it towards the police officers who spotted the knife and responded, neutralizing her,” a Jerusalem district police spokesperson said. According to ZAKA, which is handling the terrorist's body, the terrorist is roughly 16-years old.